One pizza was made off all Christmas dinner leftovers laying in the refrigerators. 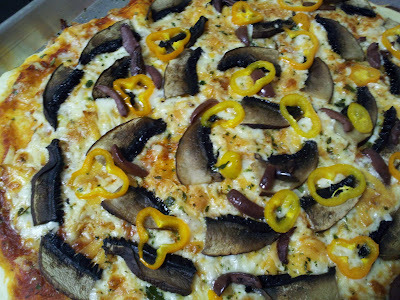 Another one was a vegetarian, with portobello mushrooms, pepper, olives and lovage. GREAT use of leftovers! My teenaged son would have lived off of pizza at one time!